"Love, Ethics and Social Justice: Transforming the Self in the Service of Others"
The conference image above is a mural painted by Pittsburgh artist and Croatian immigrant, Maxo Vanko, in 1937. The title of the painting is "Immigrant Mother Gives Her Sons for American Industry." Along with Andy Warhol and others, Vanko is among Pittsburgh's most celebrated artists. His work often explores the theme of human dignity and self-sacrifice, motifs that resonate with the theme of the conference. 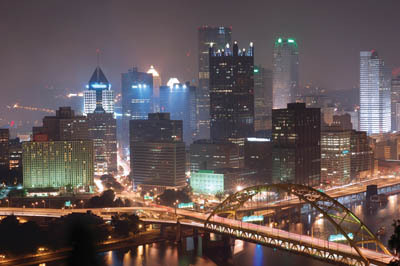 The 10th Annual Conference of the Society for Humanistic Psychology, Division 32 of the American Psychological Association, will be held March 30 through April 2, 2017 at Point Park University in Pittsburgh, Pa.
Humanistic psychology is not only set apart by a concern with research methods that are qualitative in addition to quantitative in design, and we share more than existential skepticism regarding metaphysical claims about what it means to be human. Humanistic psychology is even more fundamentally pulled along by values of an ethical nature. As recently endorsed by the Executive Board of the Society for Humanistic Psychology, humanistic psychologists share an ethical presupposition, which affirms the dignity of persons. Humanistic psychologists rally around a call to be concerned for the other, and to transform ourselves in the service of others. Rather than an aspiration to value neutrality, therefore, humanistic psychology has traditionally and explicitly been concerned with activities that are engaged with issues of social justice. It is in the spirit of social justice that we aim to address theoretical and practical applications of the attitude of agape love - an unconditional commitment to the good of others, and self-sacrifice for the sake of others - as a mood through which the dignity of the other is revealed. And this is an attitude endorsed by all of the major contributors to humanistic psychology. Maslow referred to this concern for the other as "love knowledge"; Rogers endorsed it through his emphasis on the therapeutic relationship based in unconditional positive regard, empathy, and genuineness; Frankl endorsed love as a major source of meaning in life; and Rollo May, after Paul Tillich, emphasized the dialectic between love and will. All proposal themes are encouraged and invited for the conference. Proposals that address the conference theme, "Love, Ethics, and Social Justice: Transforming the Self in the Service of Others," are especially encouraged. Please see the 2017 conference presentation schedule. Online pre-registration is now closed. Please register on site at the Society for Humanistic Psychology Conference registration desk in the Lawrence Hall lobby. Credit cards and checks will be accepted. Please note, those paying the full registration rate or the day rate must pay using credit card or check only; no cash will be accepted. Mary Watkins, Ph.D., is chair of the M.A./Ph.D. Depth Psychology Program, a founding faculty of its Community Psychology, Liberation Psychology and Ecopsychology Specialization, and Coordinator of Community and Ecological Fieldwork and at Pacifica Graduate Institute in Carpinteria, Calif. She is the author of Waking Dreams, Invisible Guests: The Development of Imaginal Dialogues, co-author of Toward Psychologies of Liberation, Talking with Young Children About Adoption, Up Against the Wall: Re-Imagining the U.S.-Mexico Border and a co-editor of "Psychology and the Promotion of Peace" ( Journal of Social Issues, 44, 2). She has written essays on the confluence of liberation psychology and depth psychology. She works at the interfaces between Euro-American depth psychologies and psychologies of liberation from Latin America, Africa and Asia. She has worked as a clinical psychologist with adults, children and families, and with small and large groups around issues of peace, envisioning the future, diversity, vocation, immigration and social justice. Dr. Leitner is a retired professor of psychology at Miami University in Oxford, Ohio. He is a past president of the American Psychological Association's Division of Humanistic Psychology and former editor of The Humanistic Psychologist. He has authored more than 80 articles and chapters on experiential constructivist understandings of psychopathology and psychotherapy. He also has authored or edited four volumes: Personal Constructivism: Concepts and Applications (with Jill Thomas, Pace University Press, 2009); Assessing Experience in Psychotherapy (with A. J. Faidley, Praeger, 1993); Critical Issues in Personal Construct Psychotherapy (with G. Dunnett, Krieger, 1993); and Personal Construct Psychology: Psychotherapy and Personality (with A. W. Landfield, Wiley, 1980). In 2009, he received the Rollo May Award for Outstanding and Independent Pursuit of New Frontiers in Humanistic Psychology at the American Psychological Association Convention. G. Kwame Scruggs has more than 20 years of experience using myth in the development of urban male youth. He holds a Ph.D. and M.A. in Mythological Studies with an emphasis in Depth Psychology from Pacifica Graduate Institute in Santa Barbara, Calif. Kwame also holds an M.S. degree in Technical Education with an emphasis in Guidance and Counseling from the University of Akron. He has conducted numerous workshops on the use of mythological stories to engage urban youth, presenting at C.G. Jung sites of New York, Washington, D.C., Cleveland and Philadelphia. In 1993, after being formally initiated into the Akan System of Life Cycle Development (African-based rites of passage), Kwame became a Certified Facilitator of this process. Kwame is the founder and program/training directorof Alchemy, a nonprofit organization in Akron, Ohio. Since Alchemy's establishment in 2003, the organization has served nearly 2,000 urban adolescents from Akron and surrounding communities. In 2012, Alchemy received the National Arts and Humanities Youth Program Award, presented by Michelle Obama. This is the nation's highest honor for youth-serving programs. The incredible impact of Alchemy's programs was highlighted in the national documentary Finding the Gold Within. Kwame was just recently appointed to both the Joseph Campbell Foundation Board of Directors and as a National Advisor for the Creative Youth Development National Partnership. 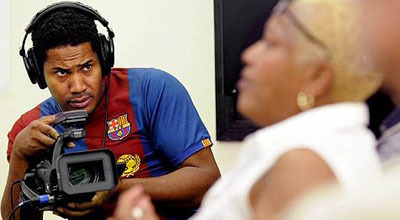 Ivey is an award-winning filmmaker who has received Addy Awards for commercial campaigns he has directed. After years of race discrimination in the Pittsburgh advertising industry, Chris decided to venture into documentary filmmaking to address not only his own frustrations with racism and public policy in Pittsburgh, but to serve as a conduit for its underserved black community. As a well-recognized artist and documentarian in Pittsburgh, Chris was recently featured on NPR's "All Things Considered: Going There in Pittsburgh" segment about the un-addressed impacts on the black community from urban renewal and gentrification. Chris is known internationally for his documentary series, East of Liberty, which focuses on race, class and gentrification fears. The East of Liberty series is a historical document and the only interactive documentation project in recent Pittsburgh history. The long-term goal of the project is to have the series available in schools, libraries and archives in order to make future generations aware of hard issues that come with urban renewal and gentrification. Currently, Chris is completing his new film, East of Liberty: Youth Rising, a film that interweaves the experiences of youth in Pittsburgh, Baltimore and Philadelphia. Through the film, we hear from students first hand about their own journeys and experiences involving teen pregnancy, gang-related activities and discussions focusing on their own futures. Chris believes that media is an indispensable tool for reaching teens, and that it is crucial for African-Americans to control the impact of media in their communities. "Through the creative use of film, we can transform a culture engulfed in self-destructive media and create alternative visions that can lead black youth to success," said Ivey. Get directions to Point Park University's campus and learn about our preferred hotel partners. Discounted rates may apply based on availability. The Fifth Annual Society for Humanistic Psychology Conference was held at Point Park University in 2012. Watch the video below to learn more about the experience and atmosphere of the conference at Point Park.